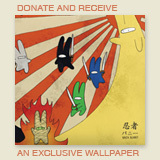 Does this mean that this is the last installment of the glorious and wonderful Ninja Bunny? I hope not; I have watched his exploits with such admiration and desire to hug him! Will you keep the page up so that I can continue to recommend it to my friends and enjoy the panels myself? I hope so. Ninja Bunny totally rocks. I have 5 bunnies myself, and I work in bunny rescue. Ninja Bunny is my inspiration and hope that, one day, an army of Ninja Bunnies will take over the world! He’s amazing! Not quite, there’s still lots of story to come before we ever get to this stage..and even then, who knows, ninja bunny might win 😉 Glad you love the comic, keep reading!